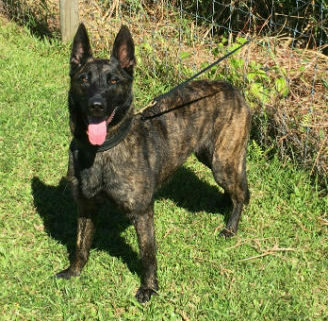 Hemi, we are very fortunate to have produced such an Outstanding Dutch Shepherd with the Beauty, Nerves and Drives to match. Very fast in her work. Strong drives for all toys. Grips are full hard with alot of fight. Hemi has Sound environmental Nerves, take her anywhere and she is ready to work. Hemi comes from well respected bloodlines (Cooper, Rocky vL. Robby bh, Kimba Wehrens, Chico, Arras, Duco II, Pecco P, Robbie T) that compliment every aspect of her work. Hips and Elbows x-rayed good. We are very excited to add Hemi to our breeding program and look foward to seeing more her her in the near future.